A man who repeatedly beat his brother in the head with a hurley stick in an "appalling and serious" alcohol and drugs fuelled attack has been jailed. Eoin Collins, 20, from Barr's Lane in Londonderry, admitted assaulting his brother outside the family home on 28 March 2018. 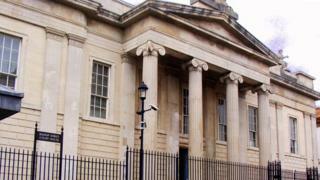 Londonderry Crown Court was told the victim, Collins' brother Conor, has forgiven the defendant. Collins also admitted assaulting three police officers at the scene. The court was told Collins kicked one officer on the leg, headbutted another and spat his blood into the face of a female police officer. He has been jailed for four years and nine months. Sentencing, Judge Philip Babington said he had taken into account the views of the defendant's family and the contents of a letter written by the victim. However, he said he had to consider the safety of the public. He said the incident followed a three day drinking and drugs taking binge. Judge Babington said Collins had an appalling criminal record of 38 previous criminal convictions, 10 of which were for assault. He said Collins had also been assessed at high likelihood of re-offending and that the number of criminal convictions for someone of the defendant's age was concerning. Collins admitted hitting his older brother with the weapon as the victim was standing and after he fell to the ground. The court heard that when police officers arrived at the scene they saw the victim lying on the ground with a pillow under his head and being tended to by a member of the public. The victim was unresponsive and a hurley bat was found in a neighbouring garden. The defendant also had a number of facial injuries and part of his lower lip was missing, the court heard. The following day, police spoke to the victim but he refused to make a statement about the incident. "He told the author of the report that he was under the influence of different substances at the time and was not in full control of himself", Judge Babington said. He added: "This was an appalling and serious assault by the defendant on his brother who at times was completely defenceless lying on the ground." He told Collins had he been convicted following a trail he would have been jailed for six years.